Perennial leafy greens, such as moringa and chaya, have been featured quite extensively in EDN. 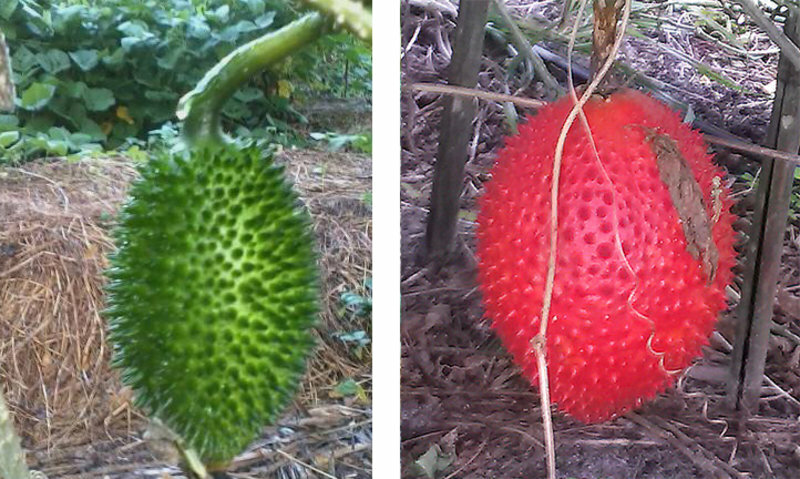 Here we focus on the bright orange-to-red fruit (Figure 7) of a tropical vining plant called gac (Momordica cochinchinensis). Belonging to the Cucurbitaceae family, other names for gac are cochin gourd, spiny bitter cucumber, and sweet gourd. Gac fruit has a mild flavor. Like moringa, it can be consumed in a variety of ways; it can be eaten fresh, cooked, or as a powder. Incorporated into traditional foods, gac adds both color and nutrition. Gac fruits are best known for their high concentration of carotenoids, natural chemicals that protect against cell damage and are the source of yellow, orange, or red coloring in fruits and vegetables. By weight, beta-carotene is more concentrated in gac fruit than carrots. Similarly, gac fruit has a higher concentration of lycopene than tomato. Much more detail about these and other health-enhancing properties of gac are available in the literature (Chuyen et al. 2015, Minh 2014). In South and Southeast Asia, where gac originates, its long (up to 6 m) perennial vines are often seen climbing on fences or into trees. Gac occurs naturally on edges of forests or rivers at 400 to 1,100 m elevation (Ecocrop 1993). It prefers full sun and a well-drained soil with good air circulation and pH near neutral (7.0). Gac is best adapted to warm, moist conditions (20-30 °C with 1,500-2,500 mm annual rainfall). However, it can also be grown in areas with dry or cold seasons; in these situations, vines die back until the return of favorable conditions, when new growth is generated from the tuberous roots. A growing season of about eight months is needed to obtain fruit. Because the fruits become soft when ripe, they are difficult to transport. Gac is well-suited, though, for the household garden. The vines have large (10-15 cm wide), dark green leaves with three to five lobes (Herklots 1972; Figure 8). Gac is dioecious, meaning that some plants will have female flowers and others will have male flowers (Figure 9). 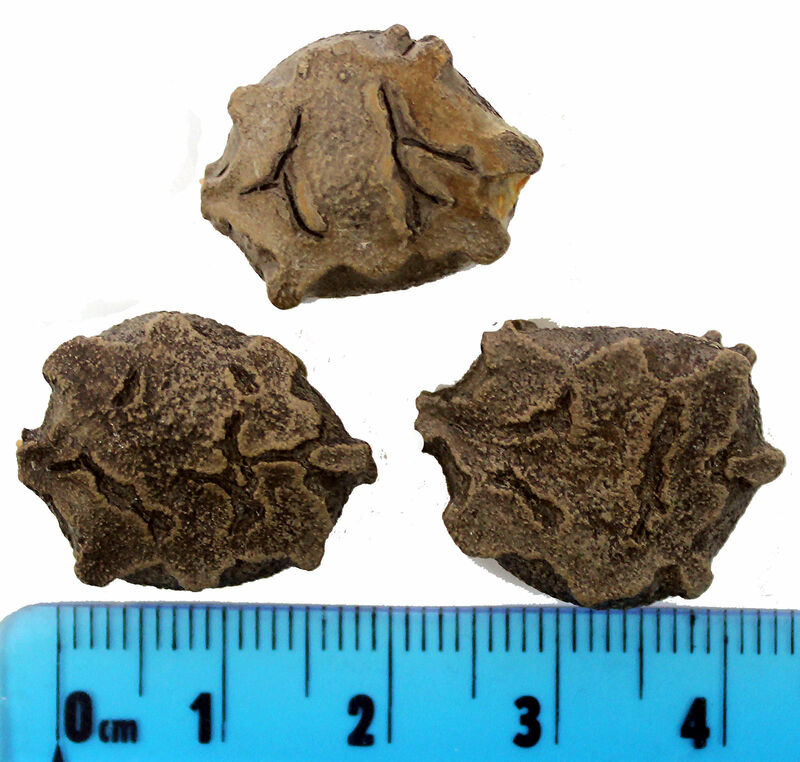 Fruits are round or ovate (egg-shaped), 10-15 cm long X 10 cm wide, and covered in short spines (Figure 7). Green, immature fruits turn bright orange or red when ripe. Just under the spiny skin is a 1-2 cm thick layer of yellow to orange flesh called the mesocarp. Beneath this layer, the inner portion of the fruit is filled with numerous red, oily sacs/membranes called arils (Figure 10). Each aril encloses a nearly flat, brown to black seed that is around 2 cm wide (Figure 11). Which parts of the plant are eaten? The arils in ripe fruits can be eaten fresh or cooked. For example, in Vietnam, gac arils are cooked with rice to make a traditional dish called xôi gac. Although the fruits are only available for a short time each year, the nutritional benefits of the arils can be preserved by drying and powdering them (see an entire thesis on this by Tran 2007), or by extracting oil with a screw-type press (Vuong and King 2003). It takes about 100 kg of fresh fruit to obtain 1 liter of gac oil. Immature/green fruits and young leaves are boiled and used in curries. 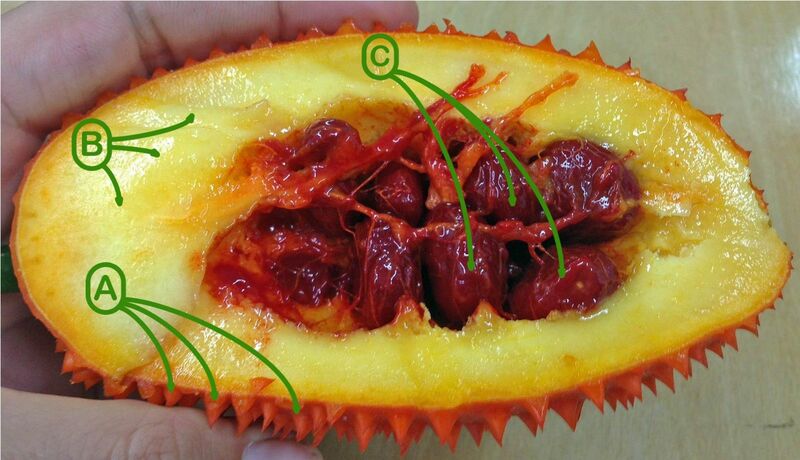 The spiny outer peel, pulp (mesocarp) and seeds are not eaten, though the pulp and peel can be used for fertilizer or to feed cattle (Chuyen et al. 2015). 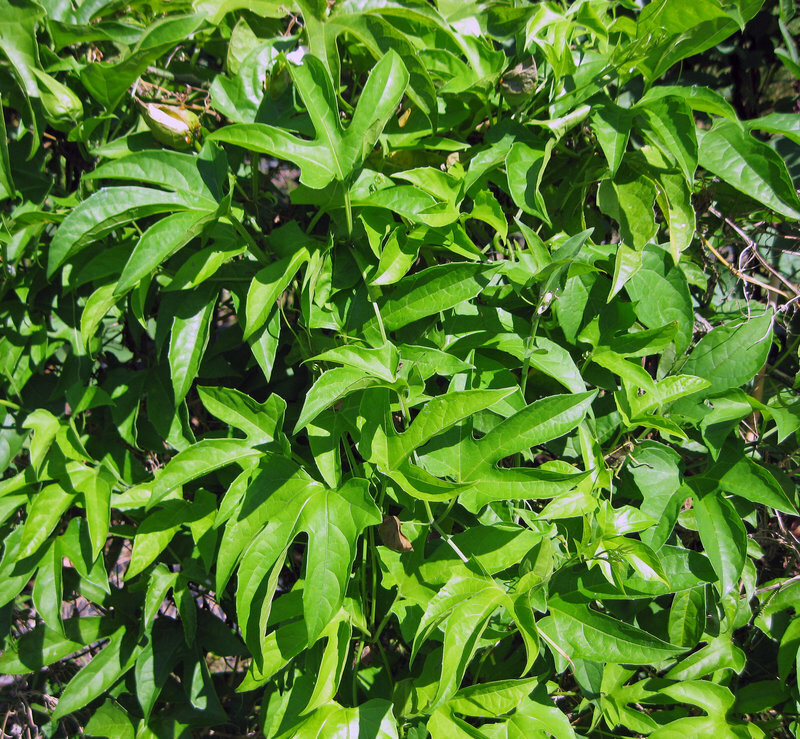 Gac can be propagated by seed, vine cuttings or root tubers. Gac seed typically germinates in one to four weeks. 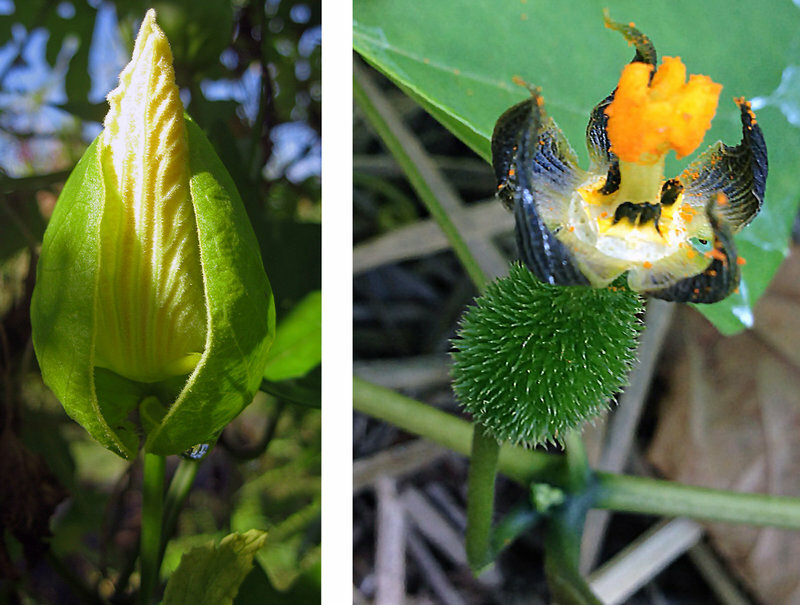 However, forty percent or more of seed-grown plants may be male, as indicated by the absence of a swollen structure [ovary/immature fruit] at the base of the flowers (Wimalasiri 2015; see Figure 9). By using tubers or cuttings, a farmer can control the number and ratio of male and female plants. For maximum insect-pollination, aim to establish about 1 male for every 10 female plants. Vine cuttings 15 to 20 cm long and 3 to 6 mm wide can be rooted in water or in well-aerated, moist potting media before transplanting to a final location (Parks et al. 2013). Since gac is a vigorous climber, able to cover entire trees if allowed, give vines adequate space (e.g. 1.5 m within and between rows) and consider pruning them. Support the vines with a lattice or trellis, 2 to 2.5 m in height, to minimize spoilage of the soft, ripe fruits. When the main stem reaches the top of the trellis, its growing tip can be removed; then laterals can be selected and trained as desired. Pollination by hand is not difficult, and may be necessary if insect pollination is not sufficient. Gac responds well to fertility inputs. Consider using similar rates as for bitter melon (Momordica charantia; as described by Palada and Chang ). Little information is available about pests and diseases of gac. Rats and birds can damage the fruits. Bitter melon, a relative of gac, is susceptible to leaf spot (caused by Pseudoperonospora cubensis), bacterial wilt (caused by Pseudomonas solanacearum), melon fruit fly (Dacus cucurbitae) and nematodes (Meloidogyne incognita) (Nguyen and Widodo 1999). Gac will usually flower 2 to 3 months after seeds or tubers are planted. Fruits are ready for harvest about 5 months after flowering. Some plants may not produce fruit until the second year after planting. A vine produces fruit once per year, over a 2- to 3-month season that depends on the region (in Southeast Asia, the season falls between September and February). Expect to harvest 30 to 60 fruits per plant, with each fruit weighing 1 to 3 kg. To save seeds for planting, collect them from fully ripe, dark orange or red fruits. Seeds are more easily separated from the arils after soaking in water overnight or in a 1:10 bleach and water solution for just a few minutes. (In the latter case, the thick seed coat will protect the seed from any bleach damage.) Seeds should then be air-dried on a counter and stored under cool, dry conditions. Gac fruit arils are an excellent source of important vitamins and antioxidants. Though gac has a short fruiting season and the ripe fruits spoil quickly, these limitations are counterbalanced by the multiple ways it can be consumed and utilized. This summary primarily describes the fruit, but several of the references below mention uses for and/or medicinal qualities of the leaves and seeds. If you live in an area where gac is grown, much more could be learned from the farmers and gardeners who are growing it. Those registered with ECHOcommunity (see www.ECHOcommunity.org for information) and actively working with farmers internationally may request a trial packet of gac seed from our Global Seed Bank. If you have experience in growing this unique crop, please share your insights on vine management (to control plant size and maximize fruit production) and on fruit preparation (any favorite recipes or suggestions for making aril powder or oil). Chuyen, H.V., M.H. Nguyen, P.D. Roach. J.B. Golding, and S.E. Parks. 2015. Gac fruit (Momordica cochinchinensis Spreng. ): a rich source of bioactive compounds and its potential health benefits. International Journal of Food Science and Technology 50:567-577. Ecocrop. 2017 (date accessed). Momordica cochinchinensis. Food and Agriculture Organization (FAO), Rome Italy. Herklots, G.A.C. 1972. Vegetables in South-East Asia. George, Allen & Unwin, LTD. London. Minh, N.P. 2014. Investigation the ratios of antioxidant supplementation into the mixture of GAC (Momordica cochinchinensis spreng) and carrier to get the highest total carotenoid content during drying. International Journal of Multidisciplinary Research and Development 1:34-40. Nguyen, H.H. and S.H. Widodo. 1999. Momordica L.[Internet] Record from Proseabase. de Padua, L.S., Bunyapraphatsara, N. and Lemmens, R.H.M.J. (Editors). PROSEA (Plant Resources of South-East Asia) Foundation, Bogor, Indonesia. http://www.proseanet.org. Accessed from Internet: 27-Feb-2017. Palada, M.C. and L.C. Chang. 2003. Suggested cultural practices for bitter gourd. AVRDC International Cooperators’ Guide 03-547, pp. 1-5. Parks, S., M. Nguyen, D. Gale, and C. Murray. 2013. Assessing the potential for a gac (cochinchin gourd) industry in Australia. Rural Industries Research and Development Corporation. Tran, T.H. 2007. Producing carotenoid-rich powder from Gac fruit. A thesis in fulfillment of the requirements for the degree of Master of Science. Center for Plant and Food Science, University of Western Sydney. Vuong, L.T. and J.C. King. 2003. A method of preserving and testing the acceptability of gac fruit oil, a good source of B-carotene and essential fatty acids. Food and Nutrition Bulletin 24:224-230. Wimalasiri, D.C. 2015. Genetic diversity, nutritional and biological activity of Momordica cochinchinensis (Cucurbitaceae). Thesis for Doctor of Philosophy, RMIT University.